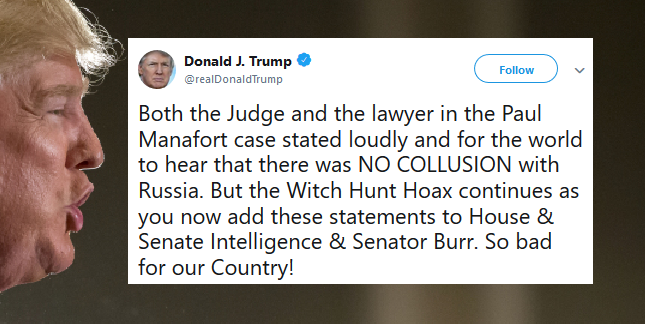 Trump: Paul Manafort Ruling Proves No Collusion - Joe.My.God. The trial of former Trump campaign manager Paul Manafort has found no evidence of any collusion with Russia, Manafort’ s lawyer Kevin Downing told reporters. The lawyer spoke after Manafort was sentenced to 47 months in prison in the US state of Virginia over bank and tax fraud related to his work in Ukraine. “Most importantly what you saw today is the same thing that we had said from day one — there is absolutely no evidence that Paul Manafort was involved in any collusion with any government official from Russia,” Downing said on Thursday.